The 7 Media Group Digital Loyalty Kiosk is a new cutting edge tool that lets you create an easy to use digital kiosk display. A digital kiosk provides your on-site customers with a user friendly and engaging display - letting them join a mobile club, check-in to a loyalty program, download your app, and/or redeem a coupon. 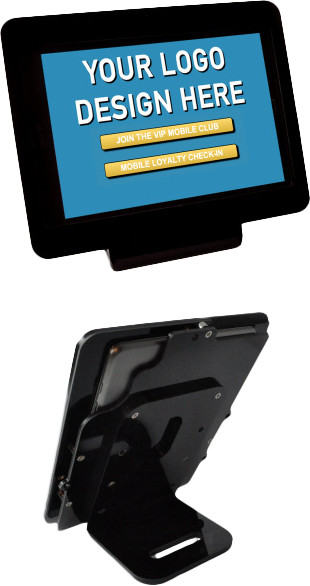 The loyalty kiosk is a stand alone tool that is easy to deploy and can be fully customized for any business. Eliminate the need for customers to carry paper or plastic punch cards which are often lost, misplaced, or forgotten. Customers can now easily check-in to a loyalty program directly through the digital kiosk by inputting their mobile number. Use the loyalty kiosk display to create a mobile club and build an opt-in database of customers that would like to receive ongoing text message promotions and special offers. Send incentives and digital coupons to your contacts which can then be redeemed and tracked directly through the Kiosk. You can even send business information and your mobile app directly to customers' cellphones. Our custom built kiosk stand and security frame is made from durable scratch resistant alluminum. The kiosk stand base can be attached to a countertop with double-sided tape or you can utilize the pre-drilled holes for a more secure setup. The security frame can be mounted horizontally or vertically on the kiosk base.